We are proud to present our first-ever DIN-bus controller with a large backlit display. Such solution significantly facilitates “communication” between the User and the heating system. 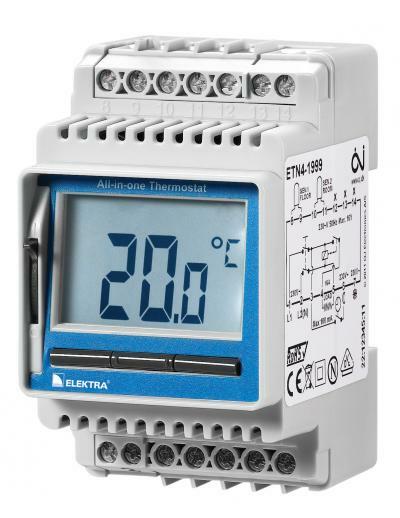 The ELEKTRA ETN4 controller has been designed with electric floor heating system’s control, anti-frost pipe protection and even cooling in mind. Noticeably wide control temperature range between -19.5°C and +70°C is worth special attention, together with the control hysteresis range between 0.3K and 10K. One very interesting solution, until now encountered exclusively in the so called “home controllers”, is the option of simultaneous operation with two temperature sensors, where the second one – to be selected from the group of ETF-144, ETF-622, ETF-744 or ETF-944 – operates as the limiting sensor. Still, due to the possibility of offsetting (from 0°C to +10°C), the controller can service many widely available sensors. Additionally, the controller features – among others – the function of blocking any accidental (or intentional but unwanted)modifications of already programmed operation parameters . One other interesting function allows to increase or decrease the temperature level , as well as set the desired value of the anti-frost temperature. Both mentioned functions are executed with the additional internal timer. The Elektra ETN4 will be available in the beginning of March.